Here's a friendly email I received last week from Jill. I'm so happy how this turned out, I wanted to share it with you. Anyway, this was sent off today to Missouri Quilt Co. for quilting, and I'm really excited to get it back. I think I'm going to join the local guild just to put this in for judging! Feel free to share with your blog! And thanks so much for all your wonderful patterns! This week you can find the MOD Bear Paw pattern here in my shop. AND if you use BEARPAW as the coupon code, you get 50% off! My MOD Bear Paw quilt 86" x 86"
Hmmm, I love this pattern! Great idea for the border! Love Jill's quilt - and especially how she has the paw prints going 'around' the corners. Super cute! I still get compliments on my Mod Bear Paw quilt. Mine is a polar bear, baby quilt size, and it is hanging on my wall. Such a great pattern! 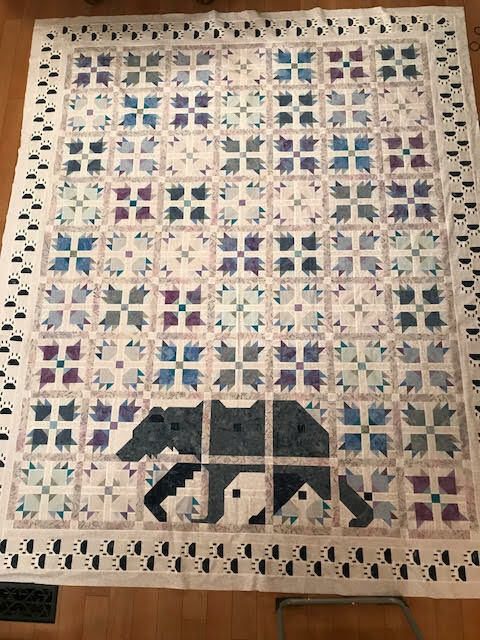 Such a great bear quilt!! This is a beautiful but very ambitious pattern. Didn’t Jill do a fantabulous job? I can’t imagine what a warm, fuzzy feeling it must be to see one of your patterns completed! Hi Lorna joined your Bee Social link up for the first time. Will enjoy reading some of the links over the next few days. Thanks for sharing Jill's quilt with us. It's gorgeous! It must be so gratifying for you as a designer to see the projects others create from your patterns, and to know how much BEAUTY and JOY you are responsible for spreading around in this world! :-) Thanks for hosting the linky party every week, too. Your bear quilt is one of my all time favourite quilts! Hope you're done well and enjoying your summer!